I have to apologize to Peter Hadfield (better known as Potholer54) as I am not sure I have found the source of the talking point that we only have 12 years. Science journalist Hadfield always encourages real skeptics to check claims by searching for the source in the scientific literature. The best solution to the riddle I found is really disappointing, but independent of the source, the claim is terrible. How much warming is seen as acceptable is a political compromise between how hard it is to change the energy system (against powerful vested interests) and how much damages people see as acceptable. All world leaders have agreed in the Paris climate agreement on the following compromise. Holding the increase in the global average temperature to well below 2°C [3.6°F] above pre-industrial levels and to pursue efforts to limit the temperature increase to 1.5°C [2.7 °F] above pre-industrial levels, recognising that this would significantly reduce the risks and impacts of climate change. 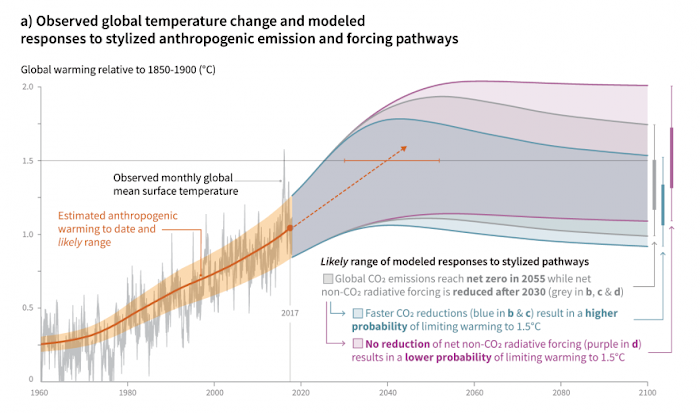 Previously the political compromise used to be to keep the warming below 2°C and most scientific work thus focused on the impacts of 2°C warming and on possible ways to make the transition that fast. After Paris politicians asked scientists to study how much the damages from climate change would be reduced and how much harder it would be to limit warming to 1.5°C. The Intergovernmental Panel on Climate Change (IPCC) thus brought all the research on this topic together and in October published a report on the difference between 1.5°C and 2°C warming. In the media reporting a frequent talking point somehow was that we only have 12 years to stop climate change. How much CO2 can we still emit? Before looking into it I had guessed the claim would be based on the carbon budget. How much CO2 we can still emit until we reach the amount that will likely warm the Earth by 1.5°C. Note that CO2 accumulates in the climate system and the warming is determined by the total historical amount we emit. I sometimes worry people think that when global warming becomes too devastating we can stop emitting CO2 and the problem is solved. When the French stopped dumping salt in the Rhine and Meuse the water quality quickly became better. CO2 is not like that. When we stop emitting CO2 warming will even continue for some time, it will not go back to the temperature we used to have and many consequences (such as sea level rise) will keep getting worse, just slower. Limiting global warming requires limiting the total cumulative global anthropogenic emissions of CO2 since the pre-industrial period, that is, staying within a total carbon budget (high confidence). By the end of 2017, anthropogenic CO2 emissions since the pre-industrial period are estimated to have reduced the total carbon budget for 1.5°C by approximately 2200 ± 320 GtCO2 (medium confidence). The associated remaining budget is being depleted by current emissions of 42 ± 3 GtCO2 per year (high confidence). The choice of the measure of global temperature affects the estimated remaining carbon budget. Using global mean surface air temperature, as in AR5, gives an estimate of the remaining carbon budget of 580 GtCO2 for a 50% probability of limiting warming to 1.5°C, and 420 GtCO2 for a 66% probability (medium confidence). This would have been a better reason for the talking point than the possible reason below, but even then we do not have 12 years, we should do more NOW. We cannot wait 12 years and then suddenly stop all emissions. We are already doing a lot, half of all new electrical generation capacity in the world is already renewable power, but we need to do more and do this now. The only time better than now is decades ago. The best time to start [reducing emissions] was 25 years ago. The second best time is today. On the other hand, the Earth does not explode in 12 years, any action reduces damages and adaptation costs. If we do not manage to limit the warming to 1.5°C, it would be better to limit it to 1.6°C than to 1.7°C, and so on. There is no brick wall we crash into, there is no cliff we fall into, there is no "deadline", CNN. Any limitation of the warming makes life on Earth better. Being lied into one Iraq war is catastrophic, but still better than 2 or 3 wars. Any analogy is imperfect, but a better analogy would be that climate change is like crossing a busy street without looking, it is a irresponsible risk and the farther you go the higher the risk. Another analogy is walking into a mine field as Michael Mann often says. We do not know when the mines will explode, better walk into the field as little as possible and not 12 meters. Reducing CO2 emission means changing our energy system and agriculture. This is a big task, and not something we will not be finished within 12 years. When we do more now, we would also have more time than 12 years to finish the task. It is much better to say that to achieve the climate goals we have set ourselves in the Paris climate agreement we have to be at zero emissions in a generation. Or that we have to half emissions in 2030. Can we avoid going through 1.5ºC? There are many issues related to the feasibility question of which physical climate-related issues are only one. The basic issue is that the effort to reduce emissions sufficiently to never get past 1.5ºC would require a global effort to decarbonize starting immediately that would dwarf current efforts or pledges. This seems unlikely (IMO). I get that there is reluctance to say this publically – it sounds as if one is complicit in the impacts that will occur above 1.5ºC, but it seems to me that tractable challenges are more motivating than impossible (or extremely unfeasible) ones – I would be happy to be proven wrong on this though. However, the press articles and TV segments on the IPCC report do not talk about the carbon budget. In most cases they do not explain at all where the 12 years comes from. The Guardian headline is: "We have 12 years to limit climate change catastrophe, warns UN." Given that English is the global language, the difficulty of the English have understanding international relations is rather surprising. The IPCC is not the UN. More importantly for this post, the headline is not explained anywhere in the article. The most surprising place to see the claim is Fox News**: "Terrifying climate change warning: 12 years until we’re doomed." That is some contrast to their evening television opinion shows operating as the PR arm of the Republican party. This article was on their homepage, in the science section, under the category "Doomsday" and republishing an article written by the New York Post. Again I cannot find a justification for the headline in the article. The Sunrise Movement will visit members of Congress to lobby for a Green New Deal on Monday, December the 10th and would like climate scientists, who happen to meet at the AGU Fall meeting in Washington DC, to join them. They also did not go to the source, but trusted newspapers when they write in their call for action: "the latest UN report says we have 12 years to rapidly transform our economy to protect human civilization as we know it." As an aside, had I been in Washington, I would have been happy to join them, I feel we need to do more to reduce climate change damages, but the Green New Deal is politics, not science. So I would not show up as a scientist (in one of those stereotypical white lab coats). We may be getting a bit closer to the solution listening to CNN. 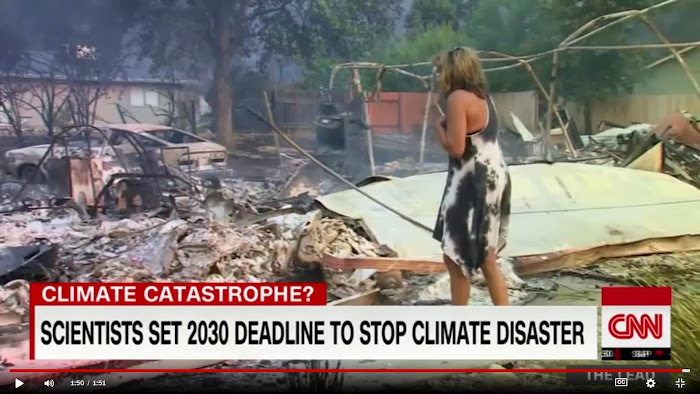 Interrupting their programming on the missing Malaysia Airlines aircraft CNN titles "Planet has only until 2030 to stem catastrophic climate change, experts warn" and says: "In Paris leaders pledge to keep the rise well below 2 degrees [Celsius]. This report now suggests we aim for 1.5°C. A benchmark we are predicted to reach in 2030." If not curbed, this trend will lead the Earth to exceed the threshold of +1.5 degrees between 2030 and 2052 (according to the different scenarios the SR15 took into consideration). This means that in just 12 years we could reach the temperature rise that the Paris Agreement hypothesised for 2100. LifeGate is a news organization calling itself "the leading point of reference for sustainable development since 2000". They at least describe this situation is sufficient detail to have a look what the source says. Chapter one of the report has the details and confirms that the period 2030 to 2052 is based on an estimate of how much the world has warmed up to now and how fast it is warming. That fits, we have warmed about 1°C and the warming is about 0.2°C per decade. So one degree more warming would be in 5 decades and half a degree warming more would be 25 years, which is the middle of the 2030 to 2052 year interval. Figure SMP1, panel a, from the Summary for Policy Makers of the IPPC Special Report on Global Warming of 1.5°C. 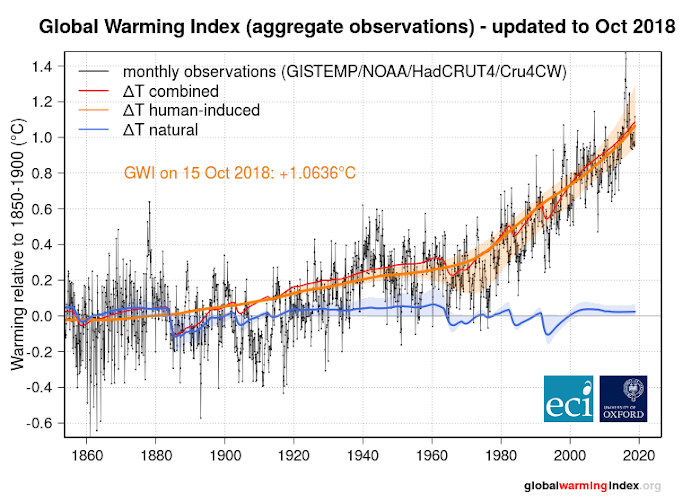 This is the warming baseline WUWT & Co., Big Coal and Big Oil and the pro-torture politicians Trump, Jair Bolsonaro and Mohammad Bone Saw Salman are fighting for, which is for comparison with climate policies that benefit humanity in the remainder of the report. The period of 2030 to 2052 is mentioned in the beginning of the report and was also mentioned early in the IPCC press conference. So it makes sense that is was noted in the press, but that they used the lower uncertainty range (12 years) and not the mean (26 years) is weird, as well as calling reaching the 1.5°C level an immediate catastrophe or deadline, while it had a different function. Maybe I am too much of a scientist, but mentioning the lower boundary of an uncertainty range makes no sense without defining the range. The IPCC used the term "likely", which is defined as a probability between 66 and 100%. If you wanted to more sure the period contains the year we will cross the 1.5°C level, for example "virtually certain" (99-100%), the range would have been much wider and the lower bound much earlier. Scientifically speaking the "12 years" without that context is meaningless. * If we define the pre-industrial temperature as the temperature of the second half of the 19th century, as the newest IPCC report did. The actual industrial revolution and our CO2 emissions started a century earlier. Politicians will have to clarify how they define their thresholds. It may be a good idea to convert the 1.5°C and 2°C limits into warming since a more recent period, as this is better defined due to much better observations. ** Clicking on the Fox News link may give you "Access Denied". Copy and paste works. Andrew King, Ben Henley & Ed Hawkins in The Conversation: What is a pre-industrial climate and why does it matter? There’s one key takeaway from last week’s IPCC report. Cut carbon pollution as much as possible, as fast as possible. In the ongoing climate negotitions in Poland, Saudi Arabia, the US, Russia & Kuwait objected to the conference "welcoming" the IPCC Special Report on 1.5°C warming, the BBC reports. The flood of messages on this BBC article suggests that climate scientists who volunteered to write the report are not amused. Given the events of the last few years, aren't we already in the "catastrophic" phase? The only remaining issue is just how great a catastrophe the clueless part of the population (the majority) will inflict on all of us. More probably, at some point in the future the discussion will be when must the clueless stop emitting CO2 to avoid apocalyptic global warming. Andy Mitchell, it is badly defined what a catastrophe is. I agree we have seen many catastrophes, which were at least in part due to global warming. Others may see global warming as a global problem and as long as there is still a rock rotating around the Earth, there is nothing happening that is so bad as to justify something so awful as having to agreeing with the left. Robert Callaghan, I hate Gish Gallops full of nonsense. One bogus claim at a time, please. And it is good commenting practice to stay on topic. So your comment was trashed. But you may have noticed that the protest in Paris continued after the gas tax was taken back. So they could just as well be seen as a protest to the elite (like Trump) transferring wealth from the poor to the rich via taxes (like Trump). The US Left would say: climate justice and economic justice go together. It is at the very least disengenious to say we are at only 1C above 'baseline' when the baseline ignores 100 + years of anthropogenic warming. Sam Carana at the Arctic News Blog has us at 1.7C above the 1750 baseline. Even that ignores the warming in the 50 years since Thomas Savery invented his coal fired steam pump in the late 1690's. The climate system sensitivity has been grossly underestimated, hence we teeter at the edge of extinction. The estimated warming of 1°C is from the IPCC. The blog you refer to states that the warming over land is 1.7°C. The warming over land is about twice as much as the warming over the ocean. The pre-industrial temperature and the temperature in the period 1850-1900 is about the same. Yes, the industrial revolution started earlier, but this produces both warming due to CO2, but also cooling due to air pollution (aerosols). The CO2 accumulates, the air pollution stays in the air only a few days. Thus initially the cooling effect is larger and only long-term the warming due to CO2 dominates. Around 1900 these two effects (forcings) are about the same size. The period 1850-1900 also had above average volcanic activity, which made a little cooler and more representative for the pre-industrial period. It is sad to see how your blog violently attacks the scientists that told you climate change is a problem. You would not know about it without the people you are attacking. Your unscientific claims of near term extinction and the far right climate skeptical propaganda have the same result: less climate action and more damage. Someone who does not realise the difference between the warming of the Earth and the warming of the land should maybe not be overconfident and attack scientists who are way more knowledgeable on this topic, resulting in more damage to humanity. You are either completely clueless about the impacts of a 2 degree warming would have on various ecosystems or are maliciously complicit in broadcasting non-scientific propaganda. Please start studying up on the actual science before you post trash like this again. Really comprehensive and well-written piece. Climate change is terrifying enough as it is, without all the terribly misreporting in the media that you've documented here.